Great picture. Do you suppose that's really what he is thinking. Humourous title. Great detail in the birds. Very sharp, dof is dead on, plus the title made me smile. Well done. 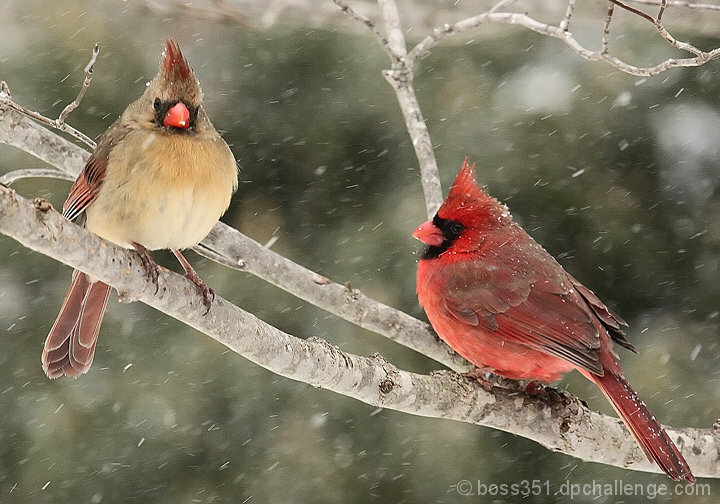 I love photos of cardinals in the snow, it just seems like a perfect winter photo. Beautiful! 8 - Nice capture of the two of them (m&f), like the snow element. Excellent caption :) Great shot. I'm a Kentuckian, but this is a fantastic photo! Proudly hosted by Sargasso Networks. Current Server Time: 04/23/2019 07:54:28 PM EDT.